Editor’s Note: This is the first of a two part article on blood borne pathogens in the martial arts. This article defines several major pathogens and their dangers. A following article will discuss infection control, prevention, “universal precautions” and what you should do if you are exposed. “Out of sight; out of mind.” “Ignorance is bliss.” “What you don’t know won’t hurt you.” How many times have we all heard these little truisms and nodded obligingly in agreement? Probably, far too often. Fortunately, there are better truisms that can save us from ourselves, such as, “Forewarned is forearmed,” “It’s what you learn after you know it all that counts,” and “It’s what you don’t know that you don’t know that will kill you.” (I may have made up that last one myself). As I was wading through the stacks of professional journal articles, textbooks and lecture notes I used as references for this part 1 and 2 of this article, I encountered two major challenges. One was the temptation to get overly in depth with the material, and the second was to present it to completion before you, the reader, went into a boredom induced coma. Outside of sitting at a lecture that is 95% histologic tissue slides, the topic of Infection Control and Blood Borne Pathogens is a guaranteed cure for terminal insomnia. I’ve footnoted and referenced things that I was not sure of, and I’ve tried to keep personal opinions to a minimum. Outside of an occasional attempt at some comic relief, all the didactic material can be easily verified, and if anyone has a question or comment, my email address is at the bottom of the article. Anytime there is physical contact, there is potential danger of exposure to your opponent’s blood through a cut, bloody nose or mouth, skin scrape or abrasion, injured toe, or other injury – something that can potentially expose you to HIV or Hepatitis B or C.
2) Other potentially infectious materials include human body fluids such as saliva, or any body fluid which may or may not be contaminated with blood. (2) Fortunately, sweat does not qualify as a potentially hazardous body fluid! The major pathogenic viruses we will be talking about in this article are Hepatitis B Virus (HBV), Hepatitis C Virus (HCV), and Human Immunodeficiency Virus (HIV) which causes Acquired Immune Deficiency Syndrome (AIDS). The Occupational Health and Safety Administration (OSHA) has determined these to be such a concern that in 1991 it published “The Occupational Exposure to Bloodborne Pathogens Standard.” (3) Although it was intended to protect employees specifically at risk of exposure to BBP, the precautions and housekeeping practices are applicable to any martial arts dojo where exposure to any of the “beasties” mentioned above is possible. Since we have already identified the most important bad guys in this game, we next need to discuss them individually, how they DO and DO NOT infect us, some current treatments, and finally prevention against infection. This last aspect is probably the most important. Exposure to blood from an injury can cause an exposure to bloodborne diseases. Once again, let me emphasize that my purpose here is not to induce a generalized panic since there has not to my knowledge ever been a case of transmission of any of these diseases having an origin in a dojo setting (but on the other side, for those who have contracted one of these diseases, they often have no idea where they picked it up). Nonetheless, I would not want to be the first one on my block to be written up by OSHA, the Department of Environmental Protection, the Centers for Disease Control (CDC) and every other professional journal on the planet. It’s one segment of my “15 minutes of fame” that I’d like reserved for something less notorious. HIV, the virus that causes AIDS, is not a major cause for alarm for most martial arts schools. HIV is a very fragile virus; it does not exist very long (maybe ½ hour) in air, and is transmitted almost exclusively by direct blood inoculation, or intimate sexual contact. Hopefully, any fraternizing that does take place is not done during class time. HIV is NOT transmitted by sweat (thank goodness) or casual contact. Practices such as kissing and sharing of drinking cups are considered casual contact. Isn’t that reassuring? Hepatitis B (HBV) and C (HCV) attack the liver. While I’m at a loss for a pithy segue between the two, HIV is not too easy to contract, but if you do it will eventually kill you. On the other hand, HBV will probably not kill you, but it is much more easily and efficiently transmitted and it is a much more resilient organism. The most frequent route of transmission in the U.S. is by high risk sexual activity. (4) For our interests though, any contact of mucous membranes or broken skin with an infected person’s body fluids, especially saliva (or blood), must be considered an exposure. (5) What that means in lay terms is that if you punch an HBV positive opponent in the mouth and you cut your hand on his tooth, you are at risk for infection. The average incubation period for HBV is 60 - 90 days. Symptoms include yellowing of the eyes and skin (jaundice), loss of appetite, feeling extremely tired, nausea, vomiting, and fever. After a bout of acute HBV infection, most people clear the disease, completely recover and are then immune to the virus. Chronic infections or “carriers” occur in about 10% of adults. A “carrier” is a person who is infected with the virus and who has never fully recovered from the infection; they carry the virus and can infect others for the rest of their lives. Chronic HBV sufferers are more likely to develop cirrhosis, liver diseases and liver cancer. The bad news about HBV is that it can live outside the human body and has even been documented to be active for as long as 8 days on a dry surface. (6) Think for a moment of the implications of this if your dojo has a rope or cloth covered makiwara and there are some reddish-brown “stains” on it! There is a silver lining to the HBV cloud though. This virus has been thoroughly investigated and the modes of transmission are all well known. Safe and effective vaccines have been developed, tested, and administered around the world. A strategy for eliminating HBV transmission in the US through universal vaccination of new babies is progressing, and global elimination of HBV through vaccination is a persuable goal. Well, just when you thought it was safe to go back in the water, last but certainly not least we have Hepatitis C. HCV has recently been deemed the most common blood borne disease in America. (7) This is one real nasty character! One of the problems is that we really don’t know as much about this virus as we do about the others. Besides normal modes of transmission (blood - blood), HCV has been transmitted via mucosal routes, i.e., getting splattered in the face and eyes by blood, and it has also been detected n the saliva of patients with chronic hepatitis, which is one of the reasons that HCV is considered the most serious of the viral hepatitis infections. Its ability to produce infections, hence a constant risk of being spread, is upward of 85%! HBV if you recall has a chronicity of only 2-10%. These chronically infected individuals with HBC also display a long term vulnerability to cirrhosis, liver failure and hepatocellular carcinoma. It is the leading cause of the need for liver transplantation in the US. The clinical course of the disease is also insidious, mild and slow to develop, and most of those who are infected are unaware that they are. 80% are asymptomatic and do not develop the typical jaundice of acute hepatitis. To make matters worse, there are not predictable, reliable, or efficacious treatments for Hepatitis C, and no vaccines are yet available for it. There is a genuine fear and concern in the infectious disease treatment community that HCV will become a far worse epidemic than AIDS. Kinda gives you something to look forward to, doesn’t it? There has also been a report of HCV being transmitted by saliva in a human bite. (8) The concern to us as martial artists should be pretty immediate. Accidentally, or intentionally, punching someone in the mouth results in a pretty good chance of blood spillage by both the “puncher” and the “punchee.” A human bite is bad enough by itself, but throw in a few potentially life threatening blood borne diseases, and you are probably not likely to get invited to too many more parties. FightingArts visited a small NYC shared dojo used by a number of judo and ju jutsu groups. At first glance, everything looked clean and spotless. 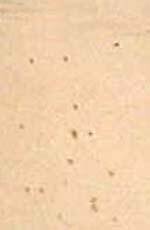 In the corner, however, were two old punching bags, which upon closer inspection were speckled with blood. We also inspected the padded floor. Again there were numerous blood stains. An enlarged photo of one is shown here. On the wall there was also a padded punching pad (makiwara). Although difficult to see, its surface was discolored by a mixture of sweat and dried blood. Any of these surfaces might contain live Hepatitis B or C viruses. Although some of the following will be mentioned in part two if this article, I think it bears discussion here as these things cannot be overemphasized. How does one go about contracting (or not contracting) these diseases? The generally recognized “Routes of exposure describe how the virus can get into your system. The term, “Inoculation” refers to having infected fluid injected into your body when something punctures your skin. Although the most common way for this to happen is from needlesticks or other cuts from contaminated instruments in the healthcare environment, the dojo presents its own risks. Inocuclation could occur by being bitten or by punching someone in the mouth and cutting one’s bare knuckles on a punchee’s tooth. Exposure to blood or other infectious materials on healthy, intact skin usually will not result in infection. However, if you have any break in the skin such as a cut, scratch, an open wound, skin tear, abrasion, or lacerations, you could be infected by exposure to contaminated blood or other infectious materials. While most are concerned with the concussive injuries that are inevitable in the karate dojo, there may also be a legitimate concern regarding the more prolonged contact that occurs in judo, aikido, or other grappling arts. While ordinary sweat is generally not considered to be an infected body fluid, but it is potentially hazardous if mixed with blood. If ANY bleeding is noticed, then those involved should STOP immediately, leave the deck, determine the source and the severity of the bleeding, and treat it properly before being allowed to continue. If your body fluids, such as from a cut, scrape or abrasion, mix with dried blood there is also the potential for any live agent to be transferred back to you. 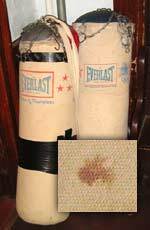 This is especially critical in any punching surface, such as a punching bag or makawara (especially a hard one, such as made of wood, that is typically wrapped in cord) where the practitioner often hits the surface repeatedly. If the practitioner has an open would on his hand, foot or other body part he will leave his own blood on the striking surface which can also potentially mix and transfer back any agents that still might be active within the dried blood, already there. 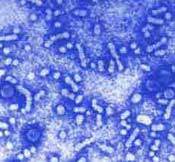 The HBV has been known to remain active on contaminated surfaces for up to 10 days. Mucous membranes (such as in the eyes or lubricated inner lining of the mouth and nasal passages) represent a potential risk of exposure, although they represent a small proportion of reported cases. It is potentially possible to transmit HIV, HBV and HCV from one person to another through one person’s blood reaching the mucous membrane of another. We’ve all seen the slow motion footage of the aerosol created by a human sneeze. Or who can forget the impact of the action shots of Rocky Balboa’s face being slammed by a right cross courtesy of Apollo Creed, and the resultant splash of blood, sweat and tears that erupted from his glove battered face? These aerosol droplets can enter the body via our mouths, noses, eyes, and any open cuts we may have. It normally requires “intimate” contact to transmit bloodborne pathogens from one person to another. This can be generally defined as direct person-to-person mixing of blood and/or other infected body fluids. Needle sticks, sexual contact (in both the Biblical and Clintonian Presidential senses), or direct inoculation, say, or during grappling direct contact (even rubbing) of opponent’s open skin abrasions or cuts. It should be noted here that assisting someone who is injured requires care to avoid exposure to the injured person's blood or other infectious materials. Dojo operators should maintain a first aid kit that includes gloves and other protective equipment and employees should be trained how to use them properly. More on this in Part 2. Generally, bloodborne pathogens are not transmitted by casual contact. I’m not personally sure if there are any hard and fast rules for distinguishing which kinds of contact go into which class but such things as sharing drinking water bottles and kissing are considered “Casual Contact.” Bloodborne pathogens have not been shown to be transmitted by contact with saliva, towels, cups, or water bottles, but respiratory and other illnesses can be transmitted by contact with these items so care should be taken. caked or dried blood (although small amounts of dried blood on clothing usually do not represent a danger). For purposes of this article, let’s consider blood and saliva as the principal body fluids that can be “infected” and therefore a direct source of concern. Once again, sweat, by itself, is not a problem. Part two of this article will discuss how to protect yourself and what you can do if you are exposed to someone else’s blood. The medical information provided in the article is of a general nature and while the author and others who have worked on or contributed to this article in some way have done their best to insure the accuracy of the information given, the author, contributors and FightingArts.com can not guarantee the complete accuracy of all factual information given, and also acknowledge that new relevant information is or might be discovered which could change, add to, or invalidate some information provided herein. If you are interested in developing a bloodborne pathogen prevention program you should seek advice of professionals trained in this field. The lead photo and the diagram of the human body and its liver were provided compliments of the Center For Disease Control. Other photos used in this article were provided by Christopher Caile. The three martial arts shots were of Christopher Caile and Shirham Hejazi trading kicks, Ultimate fighter Joel Sutton and Christopher Caile on the mat, and Aikido Sensei Roy Suenaka throwing Shihan Chad Taylor. The author would also like to thank Sterling Smith for his expertise and suggestions on Bloodborne Pathogens routes of exposure and modes of transmission. (1) US Department of Labor, OSHA Manual 3129, “Controlling Occupational Exposure to Bloodborne Pathogens in Dentistry,” 1992, page 3. (2) Clayman, Charles B., “The American Medical Association Home Medical Encyclopedia,” Vol. II, 1989, page 1050. (3) “OSHA Bloodborne Pathogens Standard,” Title 29 Code of Fedral Regulations, Part 1910, 1030 (Federal Register 56 (235): 64004-64182, December 6, 1991. (4) Gillerist, James A, Hepatistis Viruses A,B,C,D, E and G: Implications for Dental Personnel, JADA, Vol.130, April 1999, pp.509-520. (5) Palenik, Charles John, Hepatitis C, Dental Asepsis, Review/American Dental Association, Vol. 19 # 6, June 1998. (6) Glick, Michael, Infection Control, Continuing Education Lecture, May 2002. (8) Gillerist, James A., op cit, p. 515.